Beginning at age five, your child will be involved in the School Age, After School Programs at Milestones Early Educational Community in the Wolf Room. From Kindergarten onwards, the after school programs at Milestones serve as an independent resource for your child to excel in their studies, as well as furthering their developing social skills. This also gives your child time to get out their extra energy before heading home for the night. In the afternoons, the school agers are allowed a snack and time to work on their homework. After focusing on their studies, the children are then allowed free time. Continuing to follow the Reggio Emilia approach, the students will be participating and engaging in self-directed activities. 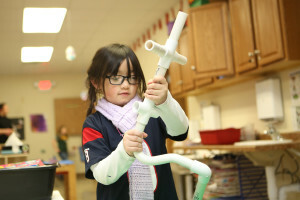 Children then have their choice between group activities such as outdoor recess and indoor games; or individual activities such as reading, coloring, and playing on the computer. The after school programs at Milestones Early Educational Community are a great independent resource for the continuing education of your student(s). As a five-star rated and nationally accredited Reggio Emilia inspired school, Milestones has adapted to the Menomonie School District Literacy Program(s), improved literacy achievement, and transferred knowledge to all other areas of schoolwork and the overall learning of our students.